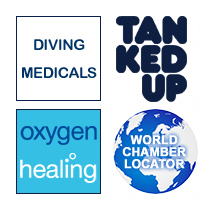 The first hyperbaric chamber on the North American continent was constructed in 1860 in Oshawa, Ontario, Canada. The first such chamber in the United States was built by Corning a year later in New York to treat 'nervous and related disorders'. The Chamber that received the most publicity and was the most actively used, was that of a Dr Cunningham in Kansas City during the 1920's. Cunningham first used his chamber to treat the victims of the Spanish influenza epidemic that swept across the USA during the closing days of the First World War. Cunningham had observed that mortality from this disease was higher in areas of higher elevation, and he reasoned that a barometric factor was therefore involved. He claimed to have achieved remarkable improvement in patients who were cyanotic and comatose. One night however, a mechanical failure resulted in a complete loss of compression and all his patients died. This tragedy was a sobering lesson but ultimately did not deter Dr Cunningham. His enthusiasm for hyperbaric air continued, and he started to treat diseases such as syphilis, hypertension, diabetes mellitus, and cancer. His reasoning was based on the assumption that anaerobic infections play a role in the etiology of all such diseases. In Cleveland, in 1928 Cunningham constructed the largest chamber ever built – five stories high and 64 feet in diameter. Each floor had 12 bedrooms with all the amenities of a good hotel. At that time it was the only functioning hyperbaric chamber in the world. Dr Cunningham was repeatedly requested by the Bureau of Investigations of the American Medical Association (AMA) to document his claims regarding the effectiveness of Hyperbaric Therapy. Apart from a short article in 1927, Cunningham made no efforts to describe or discuss his technique in medical literature. He was eventually censured by the AMA in 1928 in a report that stated: "Under the circumstances, it is not to be wondered that the Medical Profession looks askance at the 'tank treatment' and intimates that it seems tinctured much more strongly with economics than with scientific medicine. It is the mark of the scientist that he is ready to make available the evidence on which his claims are based." Dr Cunningham was given repeated opportunities to present such evidence but never did so. The Cunningham chamber was dismantled for scrap in 1937, which brought to a temporary end the era of Hyperbaric Oxygen Therapy for medical disorders.